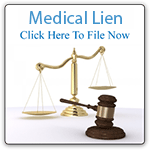 Why file a Medical e-Lien? A completely electronic lien is the way of the future. It is faster, more accurate and more economical to file liens electronically. A valid lien requires not only the right information and format to be entered on the document, but the lien must be signed, delivered, filed, returned, copied, mailed to the patient and then retained in your records. For practitioners other than hospitals and ambulance companies, liens must be filed no later than 30 days from the first date of treatment. Once resolved, the lien must then be released, which requires repeating all of the above steps. At a minimum, filing manually takes at least 2 people. Add delivery fees, travel time and the risk that a lien you prepared on your own may be invalid, and the benefits of engaging Southwest Medical Services becomes clear. For Level 1 Customers, all you or your staff need do is designate the patients who are likely subject to a medical lien and SWL, Inc. will handle everything else. Most liens will be filed within 5 business days. If necessary, a lien can be expedited and filed in 24 hours. Level 2 customers will still benefit from our services because only 1 person from your office needs to be involved and everything can be accomplished from your own computer. Your liens and lien releases can be prepared for signature and filing anywhere, at any time, day or night. They are accurate, enforceable, easily tracked and monitored. How can Southwest Medical Services make liens work for me? Regardless of which level of service you choose, SWL, Inc. can simplify lien filing and the resolution process, increase both your bottom line and free you from following the developments in this rapidly evolving business environment. For Level 1 customers, our team will aid you in the preparation, filing and resolution of valid and enforceable medical liens. We will, as your agent, assist you in deciding which liens you can and should file, prepare them in compliance with the statutes and case law, file them quickly and effectively, respond to any inquiries regarding the lien and assist you in resolving the lien. If the validity of a lien we prepare and file is challenged, pursuant to our duty under our contract, we will assume the obligation to defend the filing of the lien, employing experienced and knowledgeable outside counsel if necessary to defend the work that we have done on your behalf. And, while we will not be responsible to pay any funds that could have been recovered from the settlement, we are insured and will indemnify you for any legal costs and award of damages or court costs and attorneys fees that may result from the preparation and filing of an invalid lien. Even our Level 2 customers will find the process of filing liens easier and more efficient. Our drop-down forms will allow you to quickly prepare the necessary documents. If any necessary information is not properly inserted, the system will alert you that you have left out important information and require you to insert that information. Liens can even be filed on an expedited basis. See our Fee Schedule to find out which services best suit your needs. If you have any questions, call our office. We will come to your office to assist you in choosing the level of service which suits you. All customers will also have a password protected account which will allow you to instantly check your account status. Log on, log in and, from any computer in the world, you will be able to see how many liens have been filed, how many have been resolved, check account balances and retrieve printable copies of any liens and lien releases, as well as related documents.